Similar to the concept of Reliability computation introduced in post , we also would like to support the computation of system Availability with the model blocks. However, before talking about the availability arithmetics, again we have to clarify its meaning. 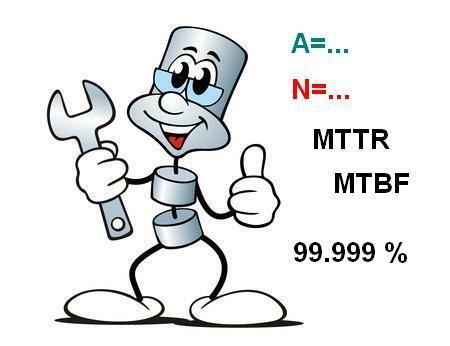 MTTR: the symbol denoting the Mean Time To Repair, the time needed to repair the system and get it back to service. To be correct, this time is not only needed for repair, but often is used to represent the complete downtime period, including fault detection and reporting, parts ordering (and delays), assembling, testing, start-up etc. 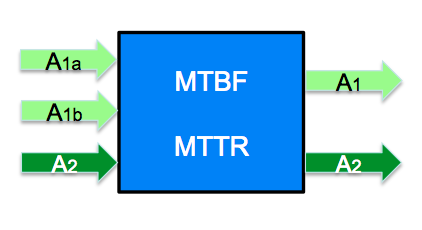 A = MTBF / (MTBF + MTTR). Although this maybe looks like a quite familiar equation, it is important to have a clear picture, to what these quantities really relate. Ok, MTBF and MTTR are kind of statistical parameters that have been estimated or gathered from the field and clearly can be associated to individual components. But with respect to A, we referred to certain services or functions of an item, that shall be available. As long as we talk about system items providing only one single service, this distinction between components and their provided functions might appear artificial and not be so obvious: we can clearly observe it being Up or Down and there is a 1:1-mapping between the hardware and the functionality. 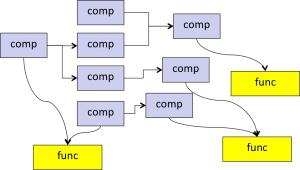 But as soon as we consider hierarchical systems or sub-systems that provide more than one single service or function, it is important to have proper and separated variable slots for the availability of system components and system functions, according to the orthogonal view we introduced earlier. In terms of building-blocks of the SmartRAM S-library in the “Availability layer” we need to provide MTBF and MTTR parameter slots only once for each component. However, concerning availability, variable slots have to be provided for each interacting service, the outgoing and the incoming ones, as illustrated in the picture. Thanks to the modular port-concept of Modelica, extending the already existing interfaces – or ports – by an additional variable for A is a matter of just one single model statement. This were some basic thoughts about the required variable slots. Adding also the required arithmetics to the existing model classes and demonstrating it along the emergency power system that we used in the risk assessment example will be topic of post  . “The system” is indeed made up of a lot of individual components – blue in this figure. But at the end of the day we’d like to have functionality, performance, not hardware. All components are only used and needed to implement the desired functions – yellow in the figure. So we usually have given requirements on the functional level, but need individual items – with their own properties – to make these functions work. No more, no less. The procedure of doing that by selecting, combining, assembling components appropriatelyis what we usually call “Engineering” – the art of Engineering. In the next post we are going to show the two inverse views within system engineering and safety engineering.